20110307 - Up, fast start, fast day. When D got home we took the car for an oil change. walked home, stopped at Library on the way and got James Bond movies. Back to desk, car done, walked to the car shop and got the car. Back to desk, finished up. 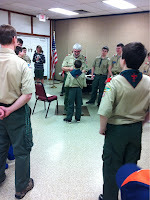 Dinner, basketball on porch, Cub Scouts for J&I, Boy Scouts for D. D got his Boy Scout neckerchief tonight. Home, got Doc, off to Bible Bangers. Home closing loops.